Start getting your business seen today. Your website should reflect the type of business you have while engaging and educating your visitors. We'll help to make sure that you have a website they'll enjoy coming back to. User-friendly features, engaging material, and high quality images are just the start of a desirable website. Make sure your site is a welcoming place that encourages users to stick around so they can see everything you've got to offer them. 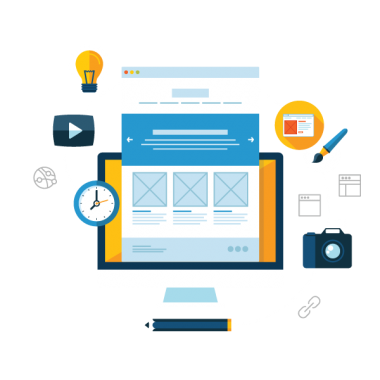 Make sure that you gain authority in your industry online with a beautiful website design that shows visitors exactly what you do without having to explain it. We'll work closely with you, combining your thoughts and ideas and transforming them into a website that looks how YOU want it to look, bringing your vision to life. "Digital marketing and advertising of our business and the development of our “RCI restoration” has elevated leaps and bounds since we have started working with CodeWithPower. There is no way we could have done this on our own! The best thing about Joel is that he really listens and spends the time necessary to really understand what OUR ultimate Goals are and one by one, we are checking them off our list! It is rare that you find a professional who delivers MORE than you expect. Thanks CodeWithPower." - Bill H.
"Code With Power has been our SEO partner for several months now and they have been excellent to work with and our results are starting to improve significantly. Our keywords have moved higher each week and we are beginning to receive more web inquiries for our services… I highly recommend “Code With Power” to any business owner that wants to make web promotion a part of their marketing strategy." - Jimmy B. Let CodeWithPower help you take back your Marketing & get in front of your customers today!